MAD MEAT GENIUS: THIRD PLACE! They marched into the International Sportsmen Show with iron pots and charcoal. The crowd parted to let the mighty Meatmen take the stage. The fire was stoked. The kettles were stirred. 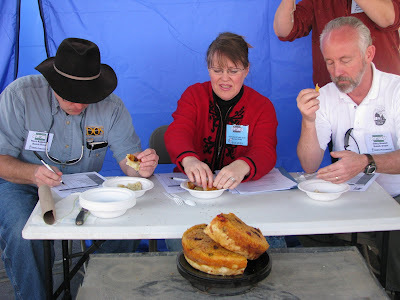 The Meatmen intrigued the judges with their Jalapeno Cheese Bread. They dazzled with a brilliant Prime Rib. To administer the knockout punch the judges were presented with a Peach Cobbler. The votes were tallied and the Meatmen were victorious with a Third Place finish. It was a beautiful day in Sacramento California. The thermometer hovered around a pleasant 65 degrees. There was a huge crowd to see the Sportsmen Show. There were plenty of people asking questions about Dutch oven cooking . A new team member was introduced to the Meatmen championship team. Sophie is a welcome addition to the Meatmen. She is well versed in dessert creation and just so happens to makes a mean cobbler. After all was said and done the Meatmen walked away with our heads held high. It was a day filled with fun and food. We left with a trophy and some parting gifts. It does not get any better. Our next competition will be the Rendezvous held in Carson City, Nevada. Chilebrown will be there to defend his last years First Place finish. See you there! Congratulations! Nicely done and welcome Sophie. I grilled and ate black bear sausage. Good job Paul! I wanted come check you guys out but ended up having to work. Way to go. Hello to the new Meatwoman. Y'all are a bunch of sillyheads. But it sounds like fun. Congratulations to all! Message from MMG's Mother--- "That boy sure knows how to cook. I hope we get some samples of the jalapeno cheese bread." That was some mighty fine chuck in the picture. Sarah Palin was a judge? You Meatmen and Meatwomen rock! Are you still up for grapefruits at Catahoula on Friday morning? How about 10am? Zoomie, that sounds fine,but,could we make it 1100am. I have some errands to do. 11:00am, it is! See you there! P.S., I invited Cranky and Cookiecrumb, too, since I have grapefruits for all. We're going out for lunch at Hilltop afterwards - ya wanna join us?